Dynamic load-bearing surface. A surface capable of supporting the loads generated by a helicopter conducting an emergency touchdown on it. Elevated heliport. A heliport located on a raised structure on land. Final approach and take-off area (FATO). A defined area over which the final phase of the approach manoeuvre to hover or landing is completed and from which the take-off manoeuvre is commenced. 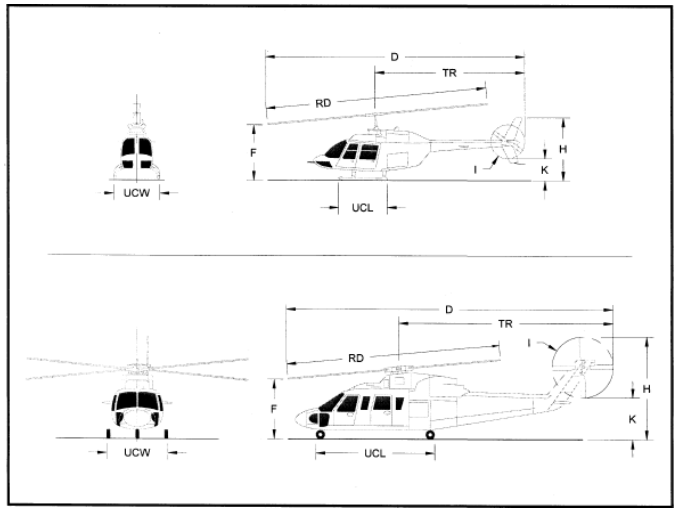 Where the FATO is to be used by helicopters operated in performance class 1, the defined area includes the rejected take-off area available. Rejected take-off area. A defined area on a heliport suitable for helicopters operating in performance class 1 to complete a rejected take-off. Runway-type FATO. A FATO having characteristics similar in shape to a runway. Safety area. A defined area on a heliport surrounding the FATO which is free of obstacles, other than those required for air navigation purposes, and intended to reduce the risk of damage to helicopters accidentally diverging from the FATO. Static load-bearing surface. A surface capable of supporting the mass of a helicopter situated upon it. Touchdown and lift-off area (TLOF). An area on which a helicopter may touch down or lift off. UCL/UCW. Undercarriage length or undercarriage width. © Anhang Technology(HK) Company limited. All Rights Reserved.